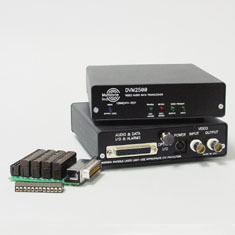 Designed for Applications that Demand High Quality Audio and Data Transmission Over Fiber. The DAM–2500 SERIES is designed for applications that demand high quality audio (24 bit) and data transmission over fiber. Applications include links from studio to transmitter (STL), studio to studio, studio to CATV head–end, common carrier, RBOC Telco circuits, distance learning, Intelligent Transportation Systems & back–haul feeds from special events. The design features differential audio inputs that greatly reduce hum and noise. The DAM–2500 is a compact unit designed for stand alone, wall mount or rack–mount applications.